Please consider writing to GLL with your preferred name – and let us know in the comments below what you’ve told them! Over 350 signatories to our petition to date. Kidbrooke with Hornfair and Eltham Labour branches; Kidbrooke with Hornfair Conservative Party candidates. 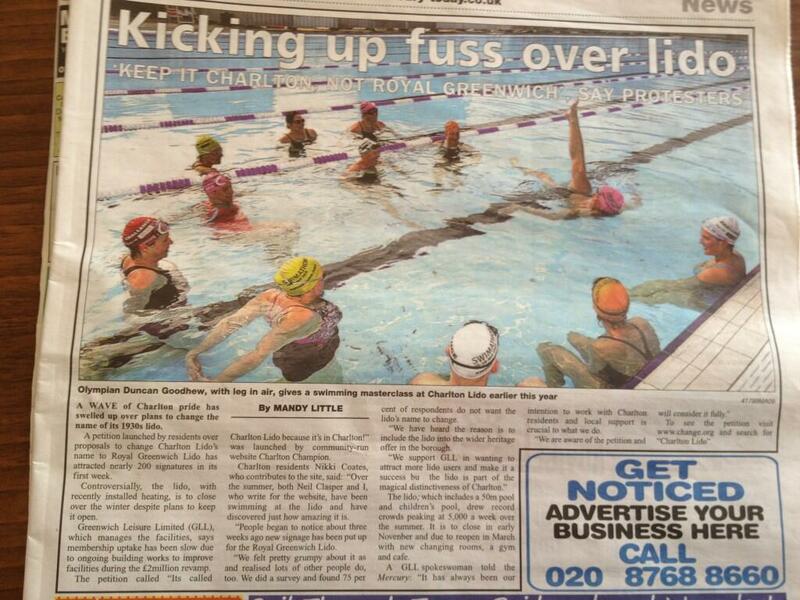 Well done Greenwich Leisure Ltd for agreeing to consult local people over the name of the Lido in Hornfair Park. To repeat our message from earlier in the week, though, the decision’s not been finalised yet, so please: sign the petition, pass it on; and let us know what you think of GLL’s new proposal in the comments below Mr Sesnan’s. I am pleased to be able to inform your readers that GLL has discussed the naming of the Lido further with the Council and we have agreed that there needs to be more consultation as to what is the best name for the new facility. GLL’s preference is now ‘Charlton Leisure Centre and Lido’, thus retaining Charlton in the name, but being clear that it is ‘more than’ just a Lido, but we are happy to hear other suggestions, however, as the owners and the people making the millions of pounds of investment and the organisation that actually has responsibility to make it work, GLL will of course make the final call on the name. We very much appreciate the level of local interest in the Lido and hope that this will be reflected in patronage when we are fully up and running. As soon as we have the relevant information we will let you know the plans for opening the new facilities in the new year and what date the pools will be back up and running in the Spring. Meantime, the pool will stay open until the end of October half term and a timetable leaflet is available at the Lido or on the web. Kids for £1 will run throughout this period. Lets all look forward to a Charlton success story (in the Royal Borough of Greenwich – of course!). Many thanks to all who have supported our campaign asking GLL and Royal Borough of Greenwich to rethink their lido renaming plans – those who’ve signed the petition, RT’d our Twitter feed, spoken to their councillors, and so on – it’s clearly an issue that’s provoked strong feelings in SE7 and beyond. The decision’s not been finalised yet, though, so please: sign the petition, pass it on; and let us know what you think of GLL’s new proposal in the comments below Mr Sesnan’s. 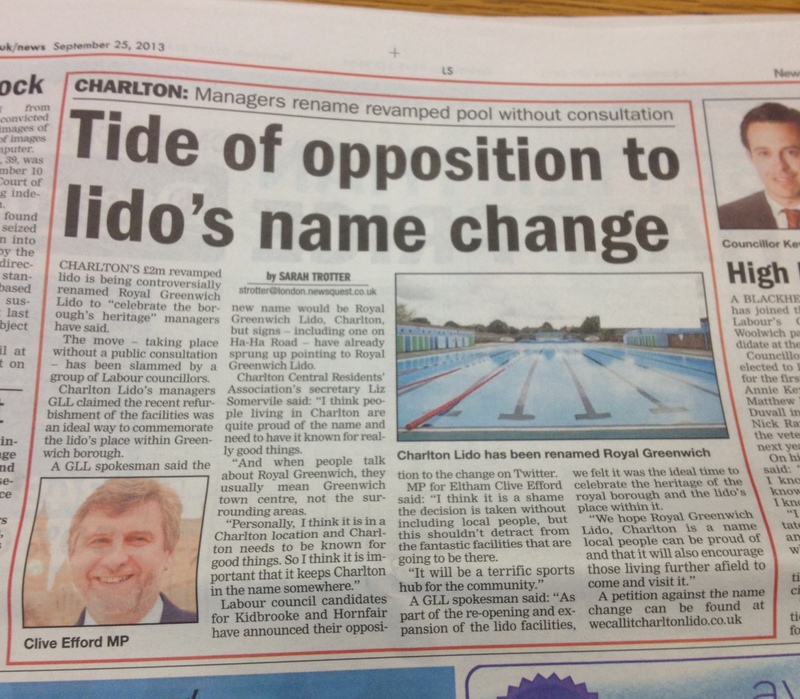 As covered on this site recently, GLL plan to re-name our local lido as “Royal Greenwich Lido, Charlton”. We polled our readers and found over 75% rejected this new name; many commenters raised passionate objections to the idea and the way that GLL have pushed it without any local consultation. Our new petition asks GLL and our councillors to reconsider: wecallitcharltonlido.co.uk. Please sign it – and share it with your friends, family, and colleagues. Even if you’re not a lido user you might want to raise an objection to this loss of local identity (and who know what else our royal-obsessed council wants to rebrand next?). We’ve seen from the success of the campaign to get a pedestrian crossing for Windrush School that this kind of campaign can have an impact – please give up a minute of your time to sign today! With over 100 signatories in the first 24 hours since launch – and backing from representatives of all the main local political parties – it’s clear that the name change is very unpopular. The petition will be presented to the next full council meeting on October 30th. As well as signing the petition, you can help this campaign by asking a question at the council meeting; more details on how to do this are here.